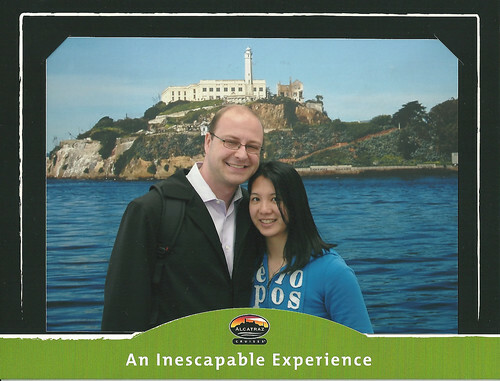 Our second day in San Francisco was devoted to more touristy things. I love touristy things! I love taking pictures with iconic statues (or ridiculously big things like the Wawa Goose, the Love statue in New York etc.) and I love to buy cheesy t-shirts. So this day of our trip was devoted to all of that. I also forgot, I love cheesy photos. I couldn’t resist this cheesy tourist photo. I added it to our collection. 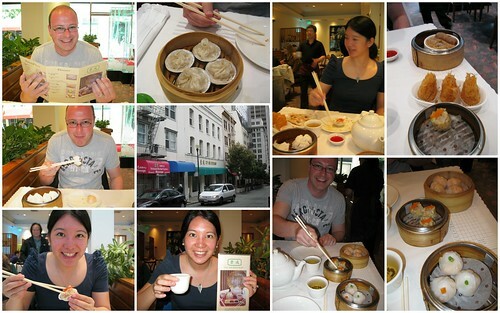 The first thing we did was head over to City View restaurant in Chinatown for dim sum. 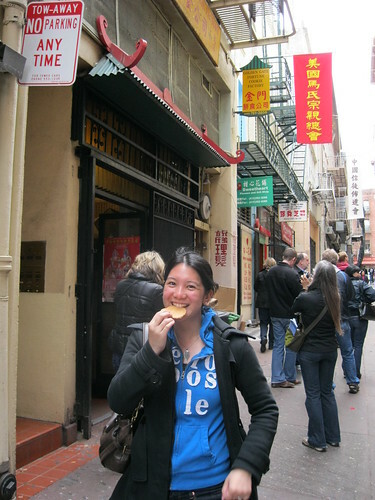 Once again, I found out after the fact that Alia had eaten dim sum here too. 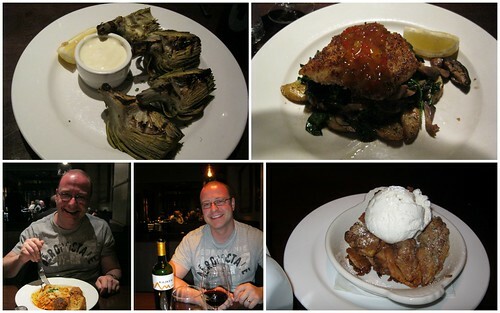 We ate my usual favourites and also tried a few different things that I generally don’t find at dim sum in Toronto, like scallop wontons etc. It was all really good and an excellent way to start the day. 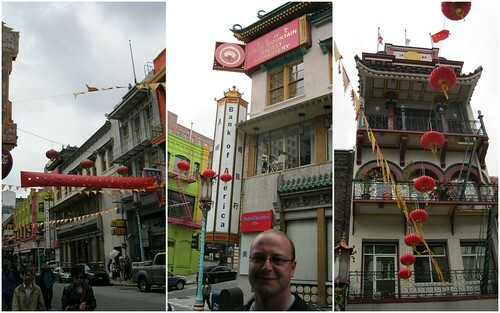 With our bellies full, we wandered around Chinatown. San Francisco Chinatown is the oldest chinatown in North America and the largest chinatown outside of Asia, so it’s full of history and also pretty remarkable. 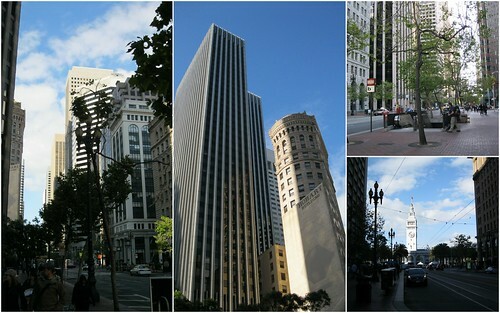 Some of the buildings even survived the 1906 earthquake. We ventured out of Chinatown and into Little Italy. I have a theory that where there’s a chinatown, there’s always a Little Italy close by. Just an observation I’ve made based on New York and San Francisco (so I don’t really have a lot of evidence about this). 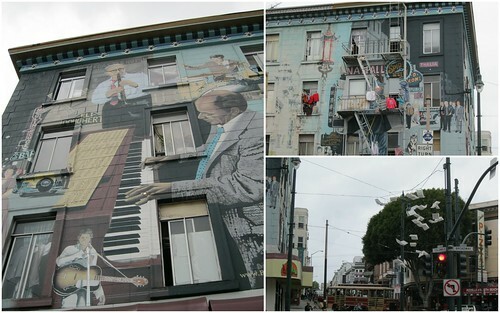 I love the street art in San Francisco. 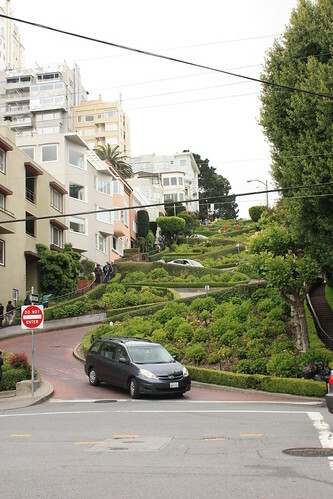 We headed over to Lombard Street (the crookedest street). 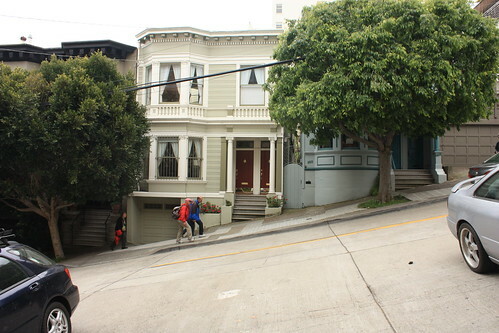 As we got closer, I noticed how steep the hills were (I know, we were in San Francisco so what did I expect right?). This made me start to panic a little about running the Bay to Breakers the next day. Running your first organized race is one thing, running on hills when you’re not used to them is entirely another. Anyway, I tried to put it out of my mind as we continued to climb. 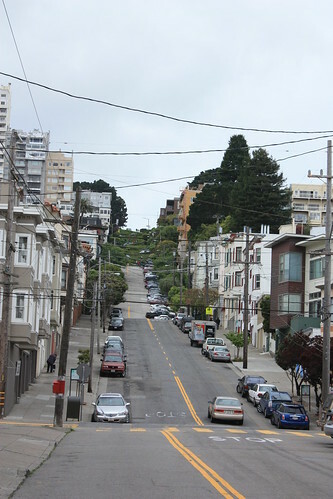 View of the street headed up to Lombard Street. This wasn’t even the steepest street. Lombard Street. I can’t even manage how strange it would be to live here, not because of how crooked it is but because of the number of tourists who flock here and stand on your driveway to take pictures. 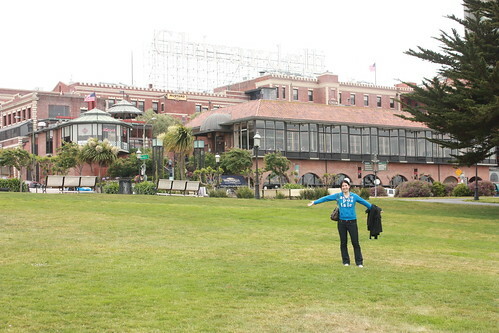 After Lombard Street we went to Ghirardelli Square for ice cream and then to Fisherman’s Wharf to explore some more. My life pretty much revolves around food so we basically moved from snack to snack. As we ate our ice cream in Ghirardelli Square there was a man singing on his guitar and making jokes. He was hilarious! He also knew how to say hello in several languages and he was really friendly. He showed us pictures of himself with celebrities (he was even on David Letterman once). 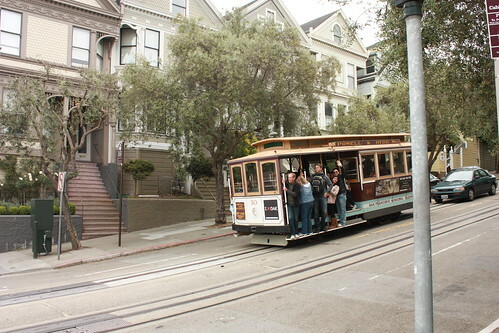 We saw this cable car on our way to Fisherman’s Wharf. I was so excited and couldn’t wait to ride it! I also love it when strangers wave in pictures. 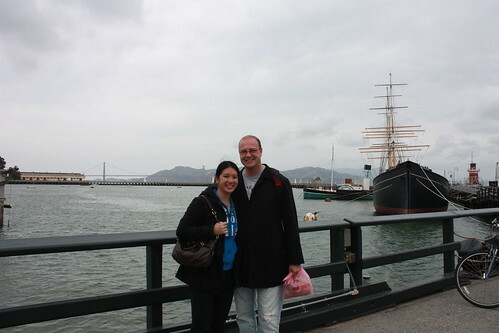 We caught a glimpse of the Golden Gate Bridge from Fisherman’s Wharf so we took a picture. We wanted to rent bikes and ride across the bridge, but decided not to (since we had a 12k run and neither of us had ever run 12k before). As I mentioned before, I move from food to food. 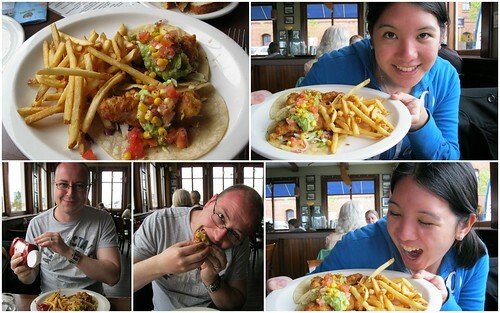 It had been a while since we last ate so we stopped for lunch at Crabby Joe’s. 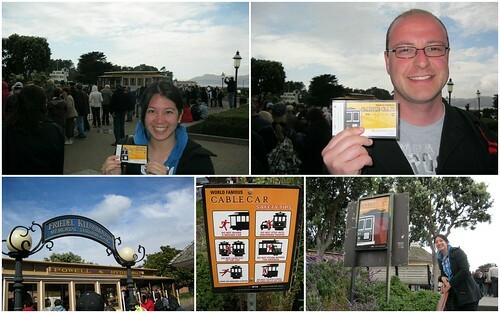 Feeling refreshed, we went to line up for our historic cable car ride. Because I love touristy things, we tend to spend a lot of time in line when we’re on vacation. We waited for over an hour for the cable car ride, but at least the sun came out! While we were waiting in line some beggars buskers entertained us by calling our attention to their friend, who was tied in chains. I couldn’t really hear but it was bad. The man in chains made gorilla noises and very ungracefully escaped. Then they asked for money. At this point nobody was really paying attention. I think many of us would have given them money to make them stop, but first we were testing the theory that if you don’t see it, maybe it doesn’t exist. I’m glad it worked! They gave up and left. 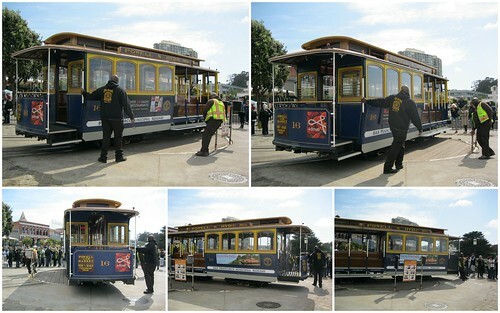 Another thing that kept us entertained in line was watching the cable car people turn the cars. It was a two person job and really fascinating to watch (or just fascinating to me). And when I say two person job, I mean two really big, strong people. The cable car was well worth the wait. When we finally got on we grabbed some seats on the outside of the car. I wasn’t brave enough to take the standing spots. It was amazing to travel down the streets and hills of San Francisco at what felt like top speed (and also pass a few other cable cars along the way. When we passed them everybody had to tuck in). What a great way to see parts of the city! The end of the line was downtown San Francisco. I love downtown skylines. I love looking at the buildings and the contrast there is from the downtown area compared to other parts of the city. That night we wandered around looking for food. Because sometimes we’re not the best at planning, we hadn’t made plans to eat in a particular place or thought to make reservations anywhere. All of the restaurants were packed and we were getting hungrier and grumpier by the minute. 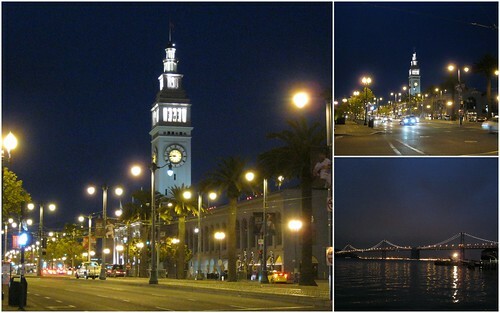 Through my hunger and grumpiness I still managed to take pictures of the Ferry Building at night. Because of this, we ended up back at Perry’s where they happily gave us a table and agreed to feed us. After this I was happy again. Then it was time for bed. We had an early start to the morning (I think Bay to Breakers was a 7 a.m. start). Next up, my race recap on running the rolling hills of Bay to Breakers – my first 12k race!